Regardless of the reason, buying a new home is a thrilling experience. The smell, the look, the feeling, everything seems new, bright and beautiful, but before you come to this point of the moving process, first you must choose the type of home you want. When considering the different options, you might hear the terms site built, modular and manufactured homes, so it is crucial to understand what they are and how they are made. Whether you want to buy an existing house or plan to build one, learning the differences between these types of homes is fundamental if you want to make the right choice. Site built or also known as stick-built homes are constructed entirely at the building site with construction materials like 2 by 4s and 4 by 6s pre-cut wood which is used mainly for trusses and framing. These types of houses conform to all state, local and regional codes where the house is located This type of home is one the value of which increases over time. Modular homes or also known as prefabricated or factory built homes are one of the most popular types of houses these days. 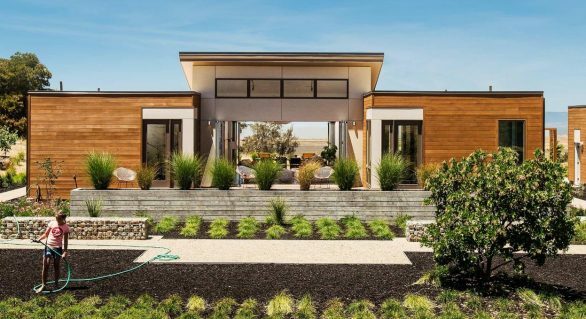 Manufacturers of modular homes have expanded their skills so much these days, so you can’t really tell the difference between site-built and modular homes. They look almost the same and most importantly, they are valued almost the same. Since modular homes are built to conform to all state, local and regional codes of their location, make sure you choose a company from which you can buy modular house that can meet all these things. Once built, its sections should be transported to the building site on truck beds and after that joined together by local contractors. Once joined, local inspectors should check to make sure the modular home’s structure meets all the needed requirements. Then and only then you can move in into your new home. Last but not least, deciding to buy modular house would be more beneficial money wise as usually they are more affordable than investing in a site built house. Manufactured homes (also known under the term mobile or trailer homes) are just like the modular ones in the sense that they are also built in a factory. Once the building site is prepped, the home can be delivered by trucks towing the individual sections on their permanent chassis. This is possible because these houses feature wheels which are usually detached once the unit is towed to the designated residence. The different sections are then joined together securely. What follows are the necessary plumbing and electrical connections after which a decorative skirt or facade is applied to the bottom exterior of the home. Generally speaking, since they are built on non-removable steel chassis and the segments are not always placed on a permanent foundation, these houses can be difficult to re-finance.